2009 ( US ) · English · Documental, Biographic · G · 78 minutes of full movie HD video (uncut). 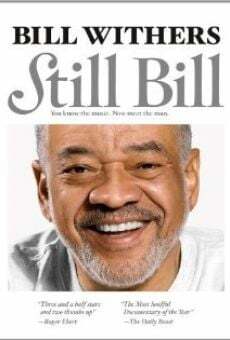 You can watch Still Bill, full movie on FULLTV - Intimate portrait of Bill Withers, a legend of soul. Bill Withers, or dignity of soul. This is the beautiful story of the last soulman good, who decided to abandon stardom and luxury at the top of his career to return to his family and friends. A tale of tears, overcome, decency and soul. And pure soul. Here a heart with brake and reverse. Here is the perfect opposite of Rick James. This is the story of Bill Withers, or a parable about the dignity, celebrity, honesty and soul. This is the beautiful story of the last soulman good, who decided to abandon stardom and luxury at the top of his career to return to his family and friends. It can be done ; It's more is recommended. Just look at his example. Bill Withers was a stutterer, asthmatic boy who thanks to the influence of his grandmother, immortalized in Grandma's hands- overcame his illness and went to work for the Air Force. And the lonely boy singing in the shower was discovered by Sussex Records, and his private songs became hits unexpected intimate soul: Is not no sunshine, Lean on me, Just the Two of Us or Use me. But Withers was not like the others, and when he saw what was done the music industry, he left to return to a life he never wanted to actually leave behind. Vlack and Baker Withers rescue his self-imposed exile to relate this story with tears, overcoming, decency and soul. And, finally, the recognition that he deserves a hero like him ... You are able to watch Still Bill online, download or rent it as well on video-on-demand services (Netflix Movie List, HBO Now Stream), pay-TV or movie theaters with original audio in English. This film was premiered in theaters in 2009 (Movies 2009). The official release in theaters may differ from the year of production. Film directed by Alex Vlack and Damani Baker. Produced by Prudence Arndt, Jon Fine, Andrew Zuckerman, Alex Vlack and Damani Baker. Screenplay written by Damani Baker and Alex Vlack. Given by Ed Marritz, Jon Fine and Damani Baker. Soundtrack composed by Bill Withers. Commercially distributed this film: B-Side Entertainment and Roco Films. Film produced and / or financed by Late Night and Weekends. As usual, the director filmed the scenes of this film in HD video (High Definition or 4K) with Dolby Digital audio. Without commercial breaks, the full movie Still Bill has a duration of 78 minutes. Possibly, its official trailer stream is on the Internet. You can watch this full movie free with English subtitles on movie TV channels, renting the DVD or with VoD services (Video On Demand player, Hulu) and PPV (Pay Per View, Movie List on Netflix, Amazon Video). Full Movies / Online Movies / Still Bill - To enjoy online movies you need a TV with Internet or LED / LCD TVs with DVD or BluRay Player. The full movies are not available for free streaming.